During the span of every artist’s career, an idea or project is sparked by the notion of creating something that is larger than life. For Axl Rose it was Chinese Democracy. For Dr. Dre, it’s still Detox. For Tech N9ne, it has been K.A.B.O.S.H. First teased in 2006 with the release of “Little Pills”, K.A.B.O.S.H. was said to be Tech N9ne’s vision of an alternative rock side project with Krizz Kaliko. Release dates came and went, and still nothing. Then in 2010, while still on the Independent Grind Tour, Tech confirmed that all of the pieces for K.A.B.O.S.H. had come together. 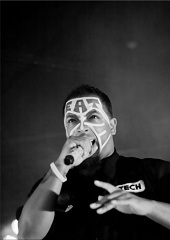 Dirty Wormz of Austin, TX would step in as the live band and Tech N9ne could finally move forward with the album. Now, the buzz around K.A.B.O.S.H. has once again begun to make waves with Tech N9ne fans. 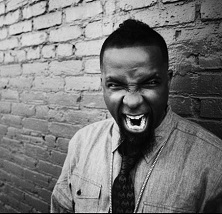 In recent interviews with Tech N9ne, the project has received a considerable amount of press thus leading everyone to believe that the album will finally happen sometime in late 2011 or early 2012. But, for all of the positive attention K.A.B.O.S.H. has received, it has also come under fire from the fans. In a shocking revelation, Tech N9ne explained to HipHopDX.com that he planned on reaching out to mainstream superstars Rick Ross and Jay-Z for features on K.A.B.O.S.H. With Tech’s recent mainstream exposure, the features certainly seem within reach, and there is no doubt about the power behind names like Rick Ross and Jay-Z. The backlash from fans was almost identical to the outrage expressed during the Lil Wayne collaboration for All 6‘s And 7‘s. Fans felt as though K.A.B.O.S.H. was meant to be a strictly rock album with no guest features, especially not from the likes of Rick Ross or Jay-Z. The rock project has definitely become very important to the fans, and it’s clear how invested they are in it after waiting nearly six years. The question then becomes, is Tech N9ne alienating his fans by ignoring their expectations of K.A.B.O.S.H.? Or is Tech creating his perfect vision of K.A.B.O.S.H. no matter what anyone thinks? The problem behind projects like K.A.B.O.S.H. is that after years of anticipation, they can build an almost unreachable level of expectation that will never be met. With little to no actual material released from K.A.B.O.S.H., with the exception of a track, the fans’ imaginations are what have built their idea of K.A.B.O.S.H. The truth is, aside from Tech N9ne and Krizz Kaliko, no one really knows what K.A.B.O.S.H. is suppose to sound like in the end. Tech has publicly stated that he would like the album to transcend the stereotypical rap/rock genre, and instead challenge him to write real music. Running the risk of being written off as just another rap/rock failed venture, K.A.B.O.S.H. has not only the fans to face, but also the music world. Tech’s insistence on bringing in Rick Ross and Jay-Z has increased the attention drawn to the project. The choice to reach out to those individuals has puzzled fans who thought K.A.B.O.S.H. would be reserved for alternative rock. So, instead of focusing on the benefits of the features, the fans have attacked Tech’s decision citing their belief that neither MC could deliver on such an album. Still, there must be a reason why Tech would pick out Rick Ross and Jay-Z of all people. It is after all a common fact that Tech N9ne will not collaborate with anyone unless he feels the music calls their name. As the mind behind the entire thing, Tech N9ne should know better than anyone, yes, even the fans, who or what belongs on K.A.B.O.S.H. Jay-Z is one of the most recognizable names in music of the last decade. His influence in hip hop is immeasurable, and thanks to a critically acclaimed mash up project with Linkin Park, he has already shown that he can adapt to the world of rock. Meanwhile, Rick Ross has become one of the hottest MCs in modern hip hop. From radio to television, his Maybach Music Group has grown into a worldwide brand in music. While some may not consider Ross to be a lyrical mastermind, his work with production team J.U.S.T.I.C.E. League has earned him praise for its unique instrumentation and ability to expand Ross’ capabilities as an MC. Like it or not, these two artists are well versed in the game of “real music”, and should have no problem finding their place on something like K.A.B.O.S.H. Seemingly closer than ever, K.A.B.O.S.H. now commands the Strange Music world’s full attention. Tech N9ne has confirmed that once he wraps up work on Strangeland: Collabos, he will move on to the long awaited rock album. Whether Rick Ross or Jay-Z actually end up on K.A.B.O.S.H. remains to be seen, but for those more concerned about guest features, perhaps K.A.B.O.S.H. will never meet their expectations. While Tech N9ne, Krizz Kaliko, and Dirty Wormz prepare to give fans the absolute best they have to offer, there are those who have lost hope in the project ever reaching the vision they hold for it. In that sense, they are slowly destroying K.A.B.O.S.H. for themselves.